Sometimes it crosses my mind, the fact that we are not the norm. We live in one of the most expensive parts of the country, we will soon have three children, and we do it all on one income. Yet somehow, we have never really struggled, we have never lived paycheck-to-paycheck, we have never had to survive on beans and rice and the glory of credit cards. I do not take full responsibility for the majority of this—after all, in our nearly dozen years of marriage we have seen God's hand in our lives, and how even when things shouldn't have worked out, they just did. Over and over. We have also been grateful to avoid health issues, or any major unexpected bills that tend to significantly alter anyone's financial situation. And even when Jay lost his job a little over a year ago, we were remarkably fine and able to sustain our lifestyle until he found new employment. That said, there are also a great deal of habits we have lived by and limits we have set for ourselves and our family that have helped us financially throughout the years. I'm always curious how other families make it work (especially those on one income who don't live in the midwest) and thought I'd share a bit of our own story with you. To begin, I have to first admit that my husband and I are both savers. Typically, there will usually be one saver and one spender within a marriage, but it seems both my husband and I were cut from the same thrifty cloth. This has been a huge asset to our marriage (we have never really argued about finances) as well to our ability to thrive on one income (he tends to only splurge on running shoes and I consider buying a $30 pair of Old Navy jeans extravagant). Because much of our ability to live the way we do has to do with personality, I'm in no way saying that our life and choices would be easy for anyone, nor is everything we do an obvious and simple way to make ends meet. Overall, I am grateful to have always had a save-not-spend mindset (and to have found a husband who is very much the same). But there are also sacrifices we've made—many of which don't feel like sacrifices at all, but tend to come across that way in our current culture—and I think many of these aren't obvious to people who don't know us well. Learning to make it work on one income wasn't as difficult as one would think. As I mentioned before, we didn't really have to cut out an excessive amount of additional spending—mostly because we didn't do much of that anyway. Pre-baby dates consisted of happy hour deals on appetizers and margaritas, and we didn't consistently splurge much on things like vacations, gadgets, entertainment, clothes, or home decor. We did get rid of satellite television, which I believe saved us a solid $60 or so every month (and we haven't regretted it for a second). And once I was staying home, I was able to cut our grocery budget significantly by paying attention to sales and doing a bit of couponing here and there. But overall, there weren't any significant "sacrifices" we had to make. 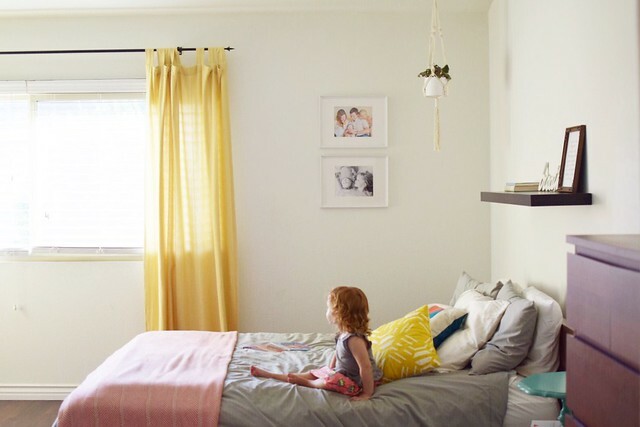 Home-wise, we lived in our cozy, one-bedroom duplex for the first four years of our daughter's life, which is almost unheard of these days, but felt completely normal and actually wonderful to us. We room-shared and generally adored our small space. It was annoying to not have a washer and dryer (or air conditioning), but in the 8 total years we lived there, our rent wasn't raised once, we had great neighbors, and our landlord was a gem. As much as we wanted to buy a home, we knew it wasn't the time, so we just made do with what we had. Even when we had our second daughter and had truly outgrown our beloved duplex, we stuck with a 2-bedroom apartment for as long as we could before buying our first home early this year. Additionally, we know the place we live in now isn't our forever home. Someday will be the day to get a larger place (especially once Eisley is older, and especially if the new baby ends up being a boy). But we aren't in a rush, and I'm glad we were smart and chose a home that works for us. Now, as far as income goes, Jay has a great job in an industry he never worked in until the last year. Getting this new job was a complete godsend in that for the first time he is within a company that has so many options for growth (and my personal favorite: certifications he can take anywhere—should we want to move out of the state someday). Additionally, I have a husband who is also very savvy and has always looked for ways to bring in additional income. For the past few years, he's also done Uber driving a couple nights a week and it's kind of amazing what a benefit that has been for our family. Living so close to LA, this is the perfect part of the country to take advantage of a business like this. With him driving only 8 nights a month (on average), we are able to consistently keep our income higher than what we spend every month. I don't share this to give off the impression of being some sort of thrifty martyr, humbly giving up the glory of monthly pedicures and Target shopping sprees in order to make it work as a stay at home mom. I definitely have days when I wish we could just spend a ton of money to decorate our new home the way I dream it to be decorated (I mean, why are area rugs and simple picture frames so expensive?) and desperately just want to get my hair done professionally every four months like I used to before having kids. But overall, I see how much we've been given (far more than most people in the world have, which is an important thought to keep in my pocket) and how giving up many of our material wants has offered us such a benefit in the long run. Just because we have extra money, we don't have to spend it. We continue to be committed to certain things: paying off our credit cards every month (but keeping credit cards for the cash-back we receive at the end of the year! ), always working hard to buy things on sale or for the best price we can find, and not buying shiny, new things just because they're the shiniest, newest things. We definitely splurge here and there—most recently we were able to buy annual passes to Disneyland for our family (which we realize is a total luxury!). But I think of all the things we didn't buy on a whim in order to be able to afford to do something that we will enjoy for the entire year, and it is pretty dang satisfying. Overall, I'm proud of the decisions we continue to make as a family, and incredibly grateful for all we've been given. I don't think I'd change a thing, looking back on our years together. I'm thankful we continue to make it work in a way that doesn't even feel like we're sacrificing anything most days, and how we always manage to have much more than what we truly need. I wish I was more thrifty. My husband is the saver, and I am definitely the spender. My goal in life is to be a weekly meal planner! Meal planning seriously saves so much money on grocery trips! I also try to plan meals from what we already have in our pantry and freezer as much as possible. (You'd be surprised how many meals you already have on hand and don't need to buy for. I always am, at least!) I am a way more organized shopper now that I'm doing that, too. Ok, you seriously have to post in the future about your grocery shopping habits (and meals)... because my jaw just dropped to the floor when I saw that you spent less than $400 on groceries for your family of four. That's crazy-impressive, girl. I meal plan and shop sales and all that good stuff, but I can't bring it under $500 (in a good month) for the two of us. One thing I completely forgot to mention is the fact that we still are mostly vegetarian at home. We don't eat meat for breakfast or lunch, and most weeks we only have meat (not counting seafood) for 1-2 dinners at the most. We've been eating this way for so long that it feels normal. so it slipped my mind when I wrote this post! :) I realize that if someone was eating meat for a majority of their meals (even just dinner 7x each week) then that would add a lot onto a grocery bill. We also keep meals very simple (often things like pasta bakes, shrimp and veggie fajitas, veggie burgers, etc.) and when Jay goes out of town the girls and I eat a lot of things like pancakes or boxed macaroni and cheese for dinners. LOL. I'm definitely planning on sharing a bit more about how I meal plan, as well as our favorite meat-free dinners that are on the rotation! I love this! I think so many people get caught up in the comparison game, or the idea that we need STUFF to make us happy. The older I get the less often I fall victim to that mentality. We are both pretty thrifty too and have been good at saving and investing, especially in the last 5 years. We just bought our first home this past December, but bought it in a less desirable area outside of Seattle because we didn't want to be house poor. We can afford our mortgage on one income if we need to, and we are paying less than we were paying in rent in Seattle! We also use public transit and/or walk as much as possible (our jobs pay for our transit as well, which is huge), and only have one car that we don't drive very often. We both love to cook at home, but I think our biggest splurge is eating out. So,so proud of you and Jay!